Shishiku castle （獅子吼城) is located at Shoroyama mountain, one of about 150 meter height from its hillside in the valley of Shiokawa river about 20 kilometer northwest from Kofu city. 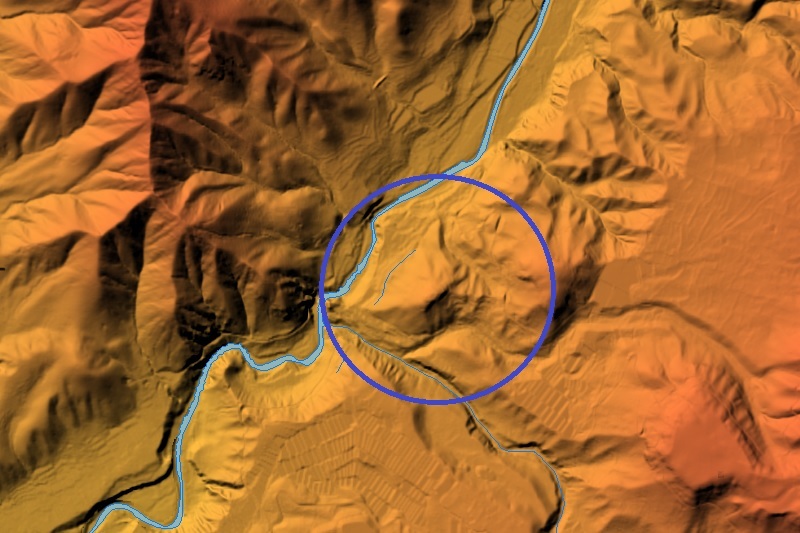 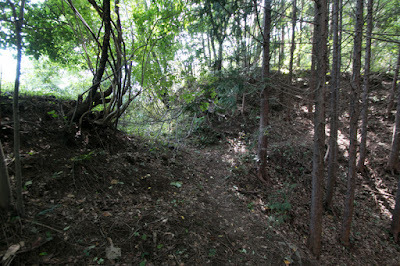 Castle site locates at an entrance of long valley which is used as a secret path from Kofu basin to Saku area, eastern part of Shinano province (Nagano prefecture) aside of its main route passes Kiyosato area. 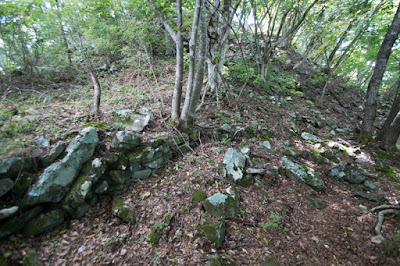 Furthermore, at Madarayama mountain opposite of Shiokawa river there was a gold mine. Shiroyama mountain locates at the merging point of Shiokawa river and its tributary, and being secured its backside by rivers, Shiromaya mountain is an appropriate place to build a castle only to secure its narrow front ridge. 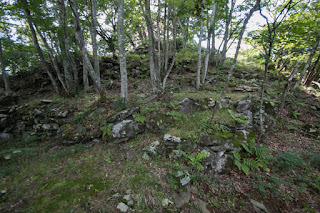 Precise year is unknown but Shishiku castle was built by 13th century, and it is recorded that Nobuyasu Takeda, son of Nobumitsu Takeda (?-1417) who was the governor of Kai province, resided this castle. Since the beginning of 16th century, Takeda clan overcame internal conflict and started expansion toward surrounding provinces. Shishiku castle was once held by local lord Imai clan but Nobutora Takeda (1494-1574), leader of Takeda clan, captured this castle and started expansion toward Saku area. 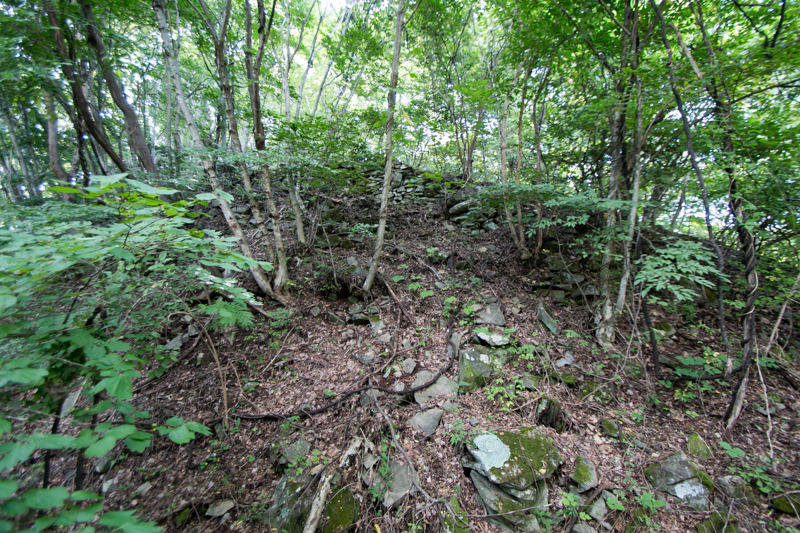 Shingen Takeda (1521-1573), son of Nobutora and famous leader of Takeda clan, continued invasion into Shinano province and captured Saku area by 1550. Under Shingen, Shishiku castle was used as a beacon point to communicate between castles. As backside of the castle is totally surrounded by sheer cliff, then this castle consist of over 10 terraces spread along the front side ridge. 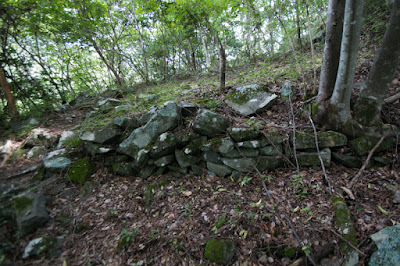 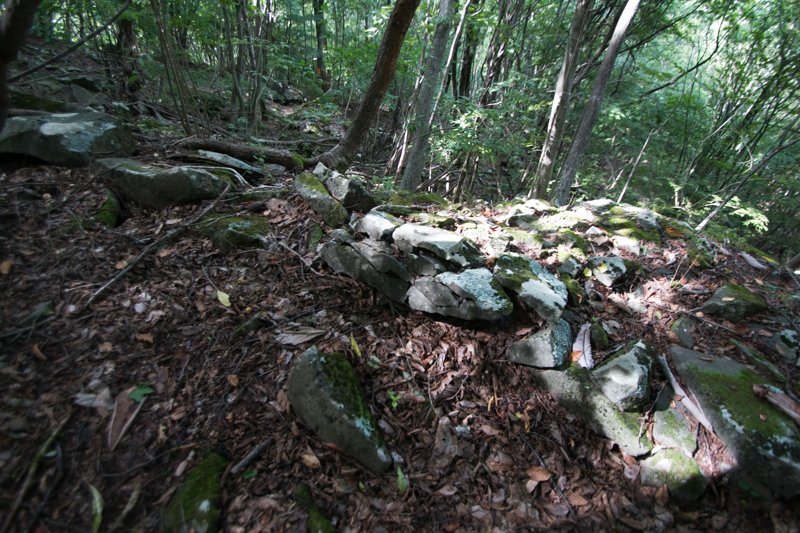 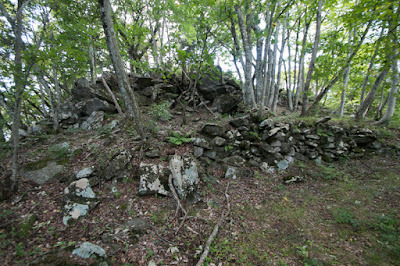 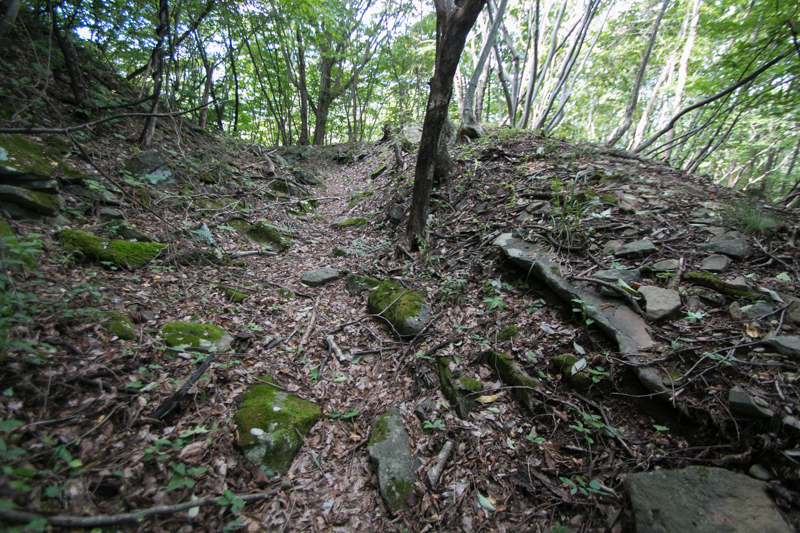 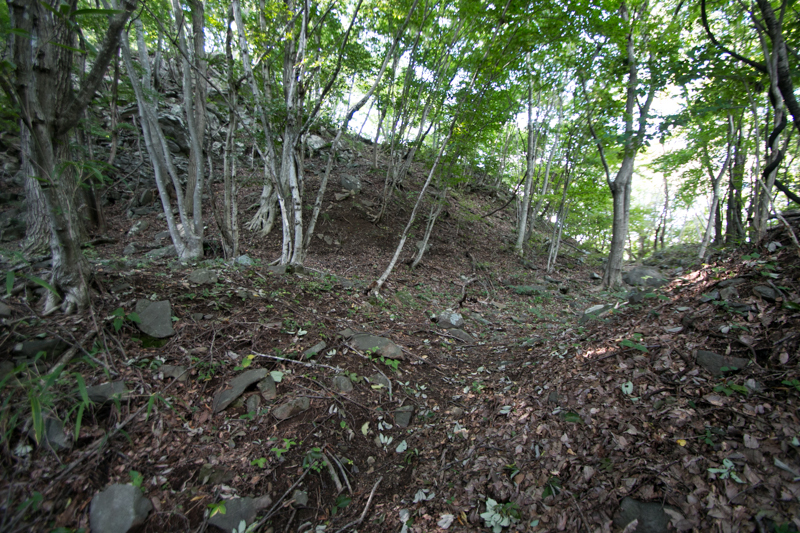 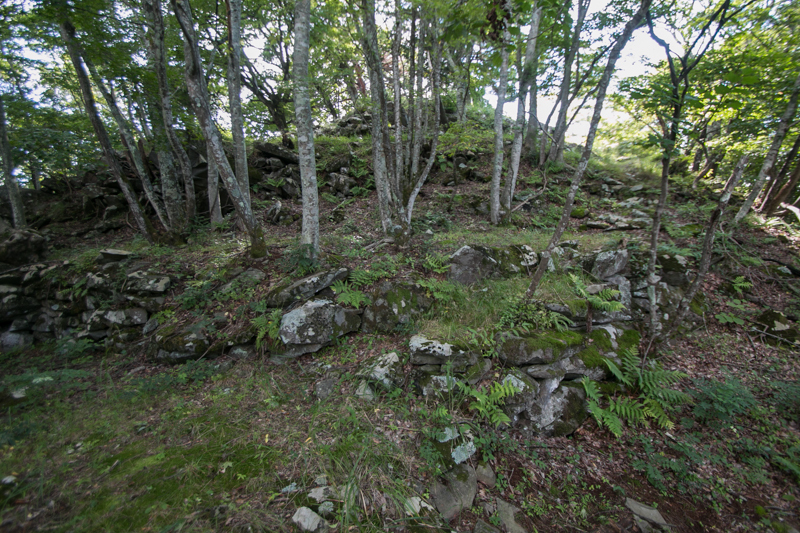 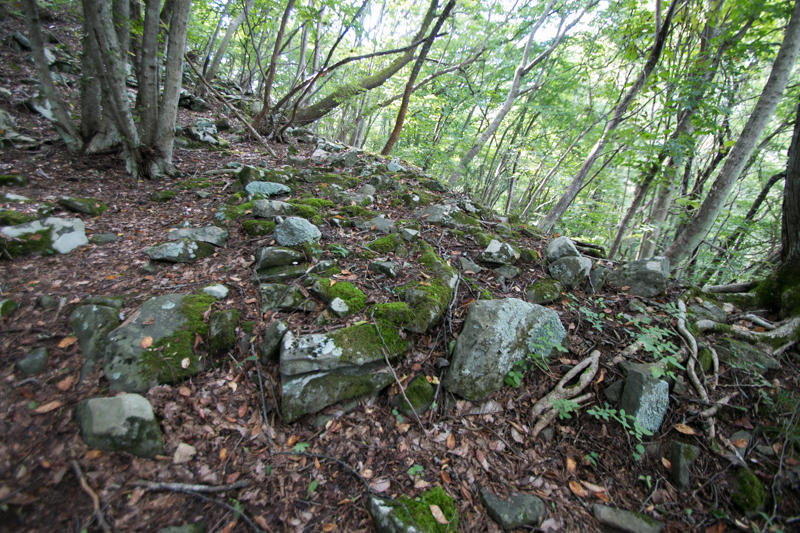 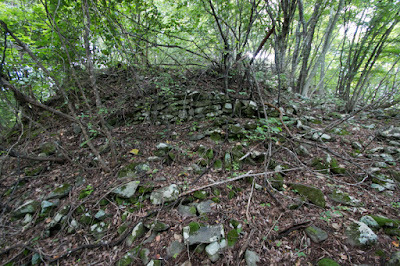 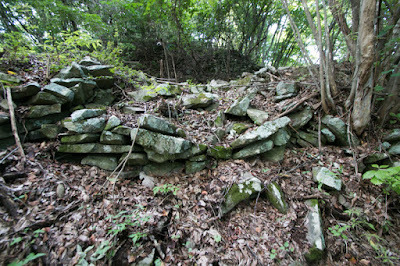 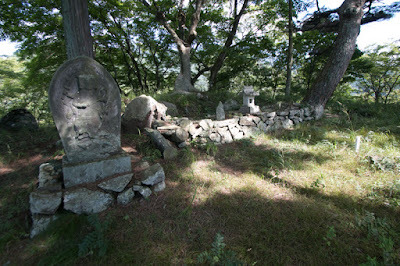 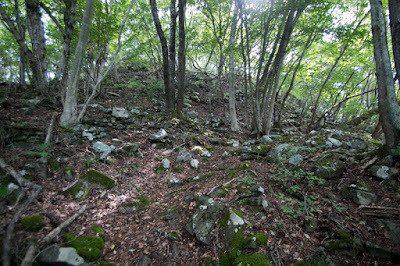 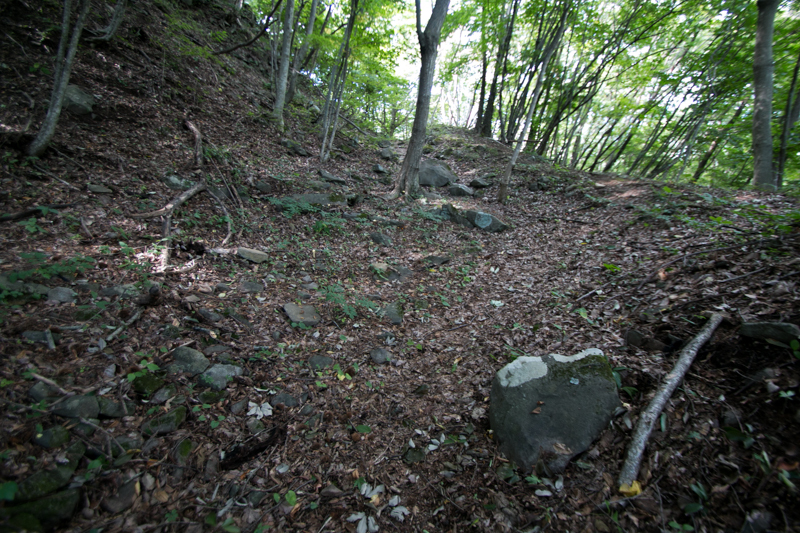 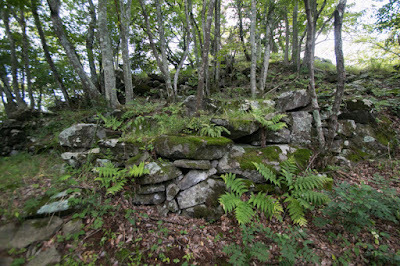 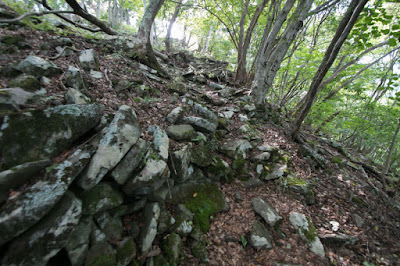 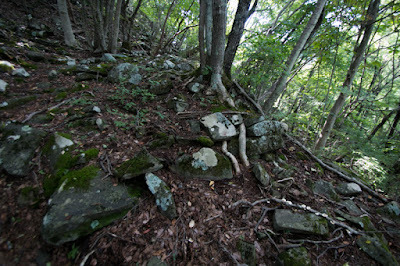 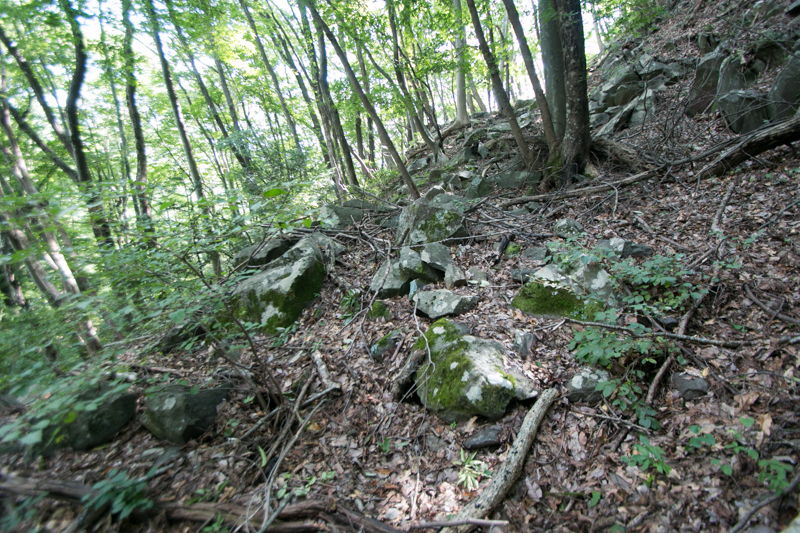 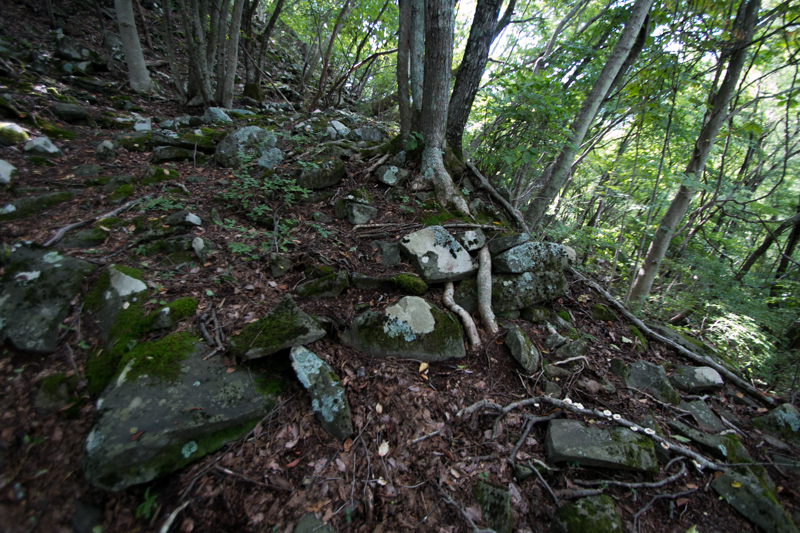 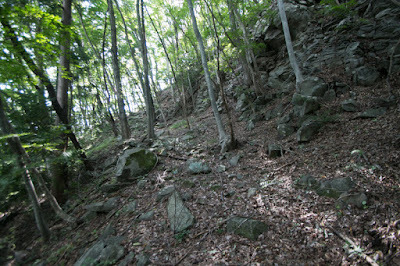 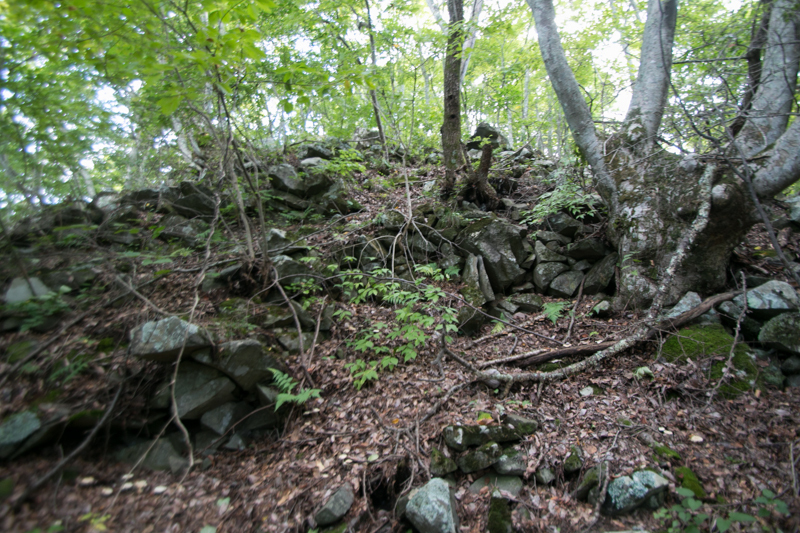 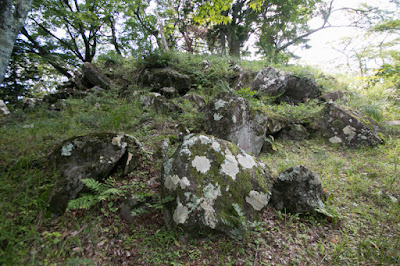 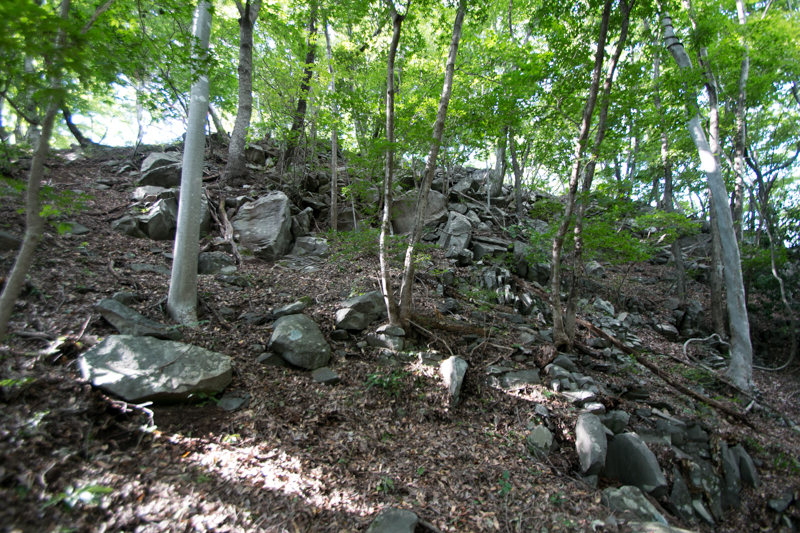 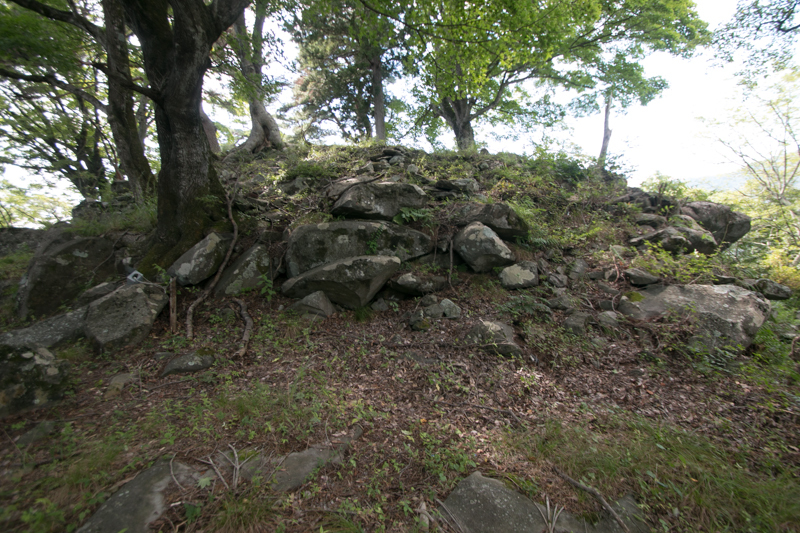 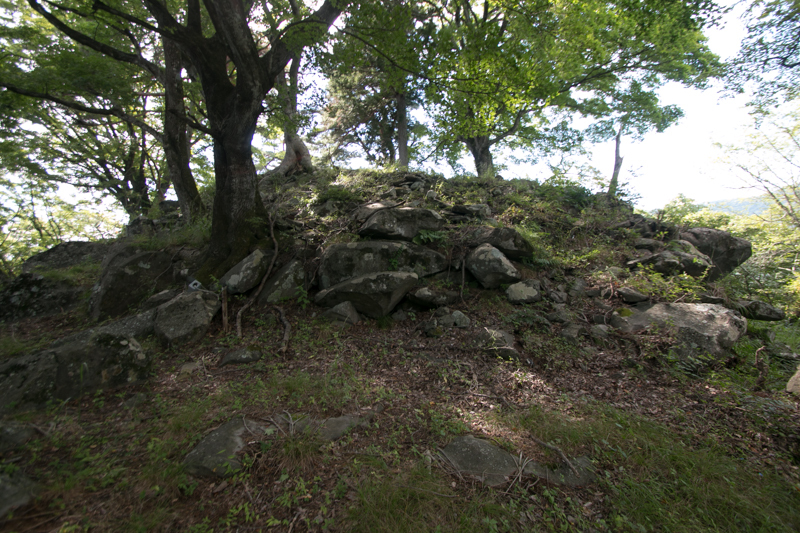 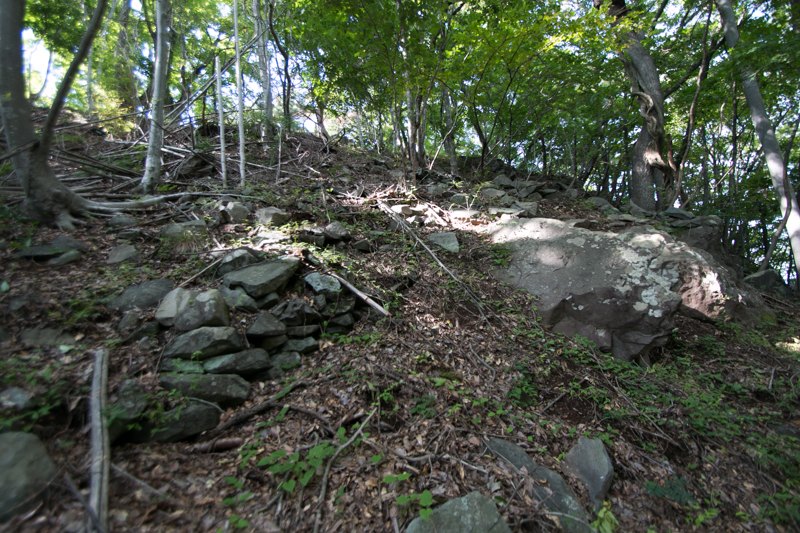 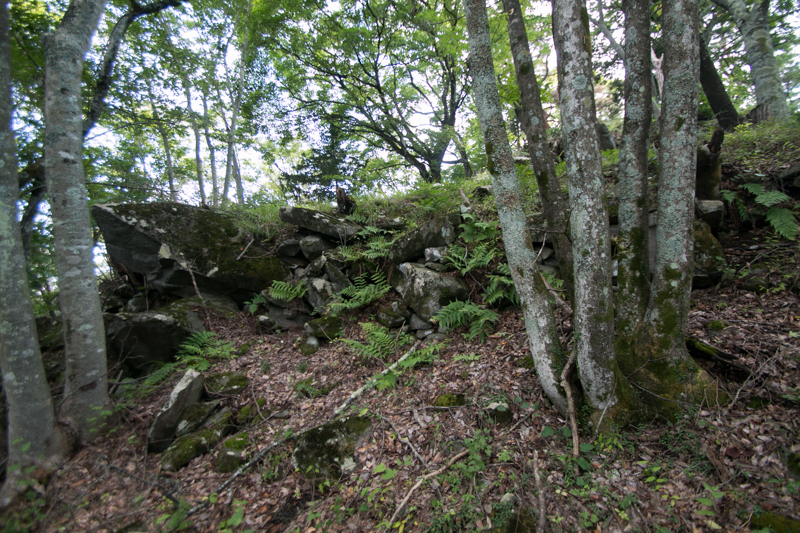 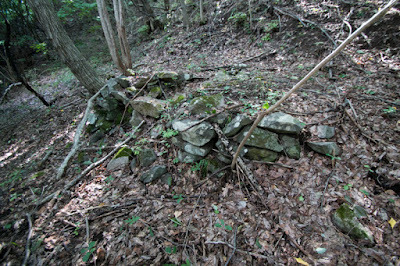 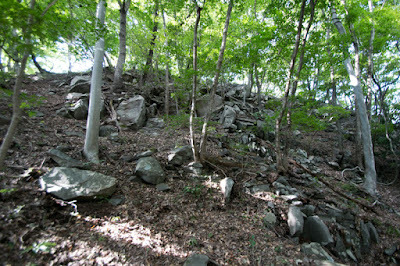 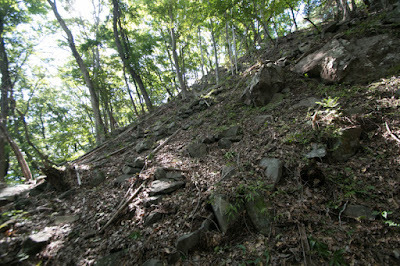 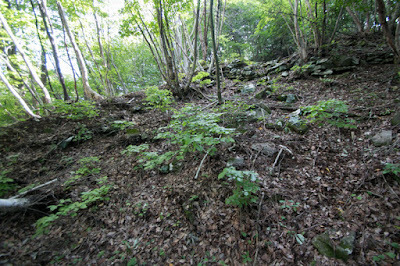 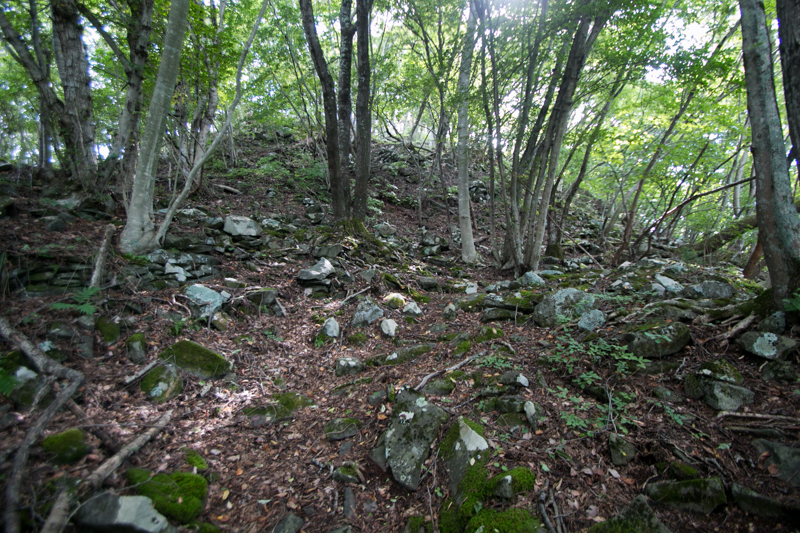 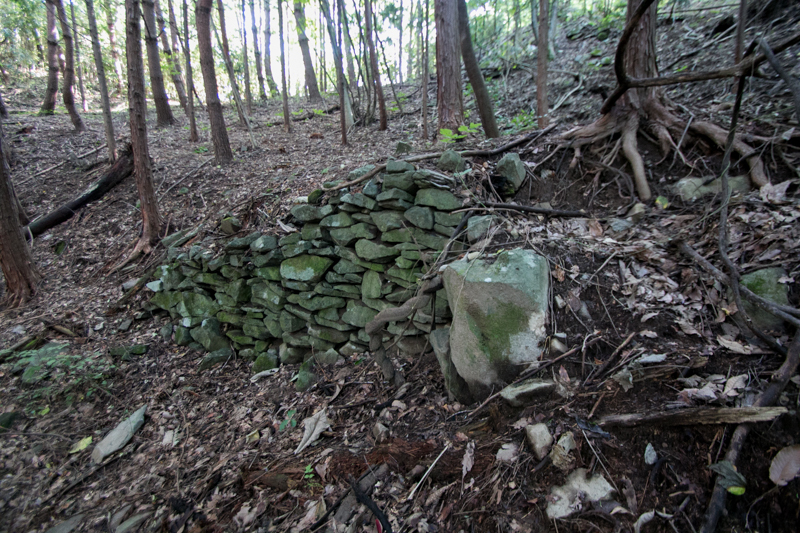 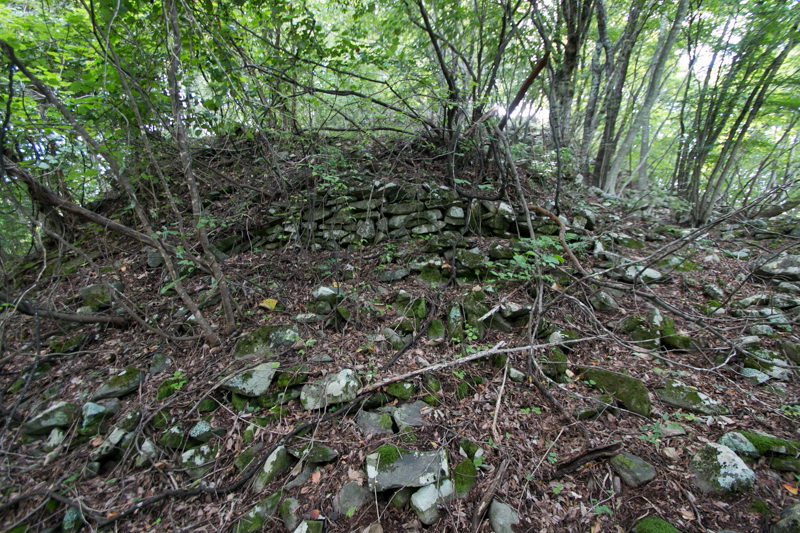 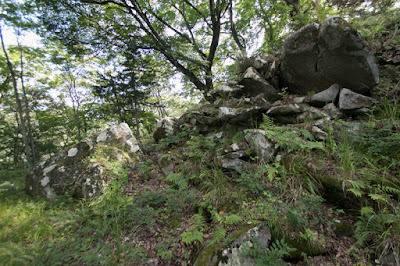 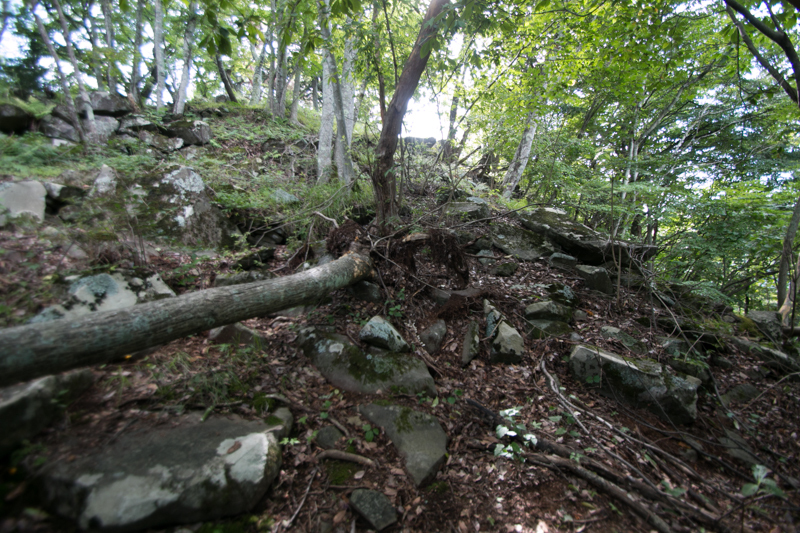 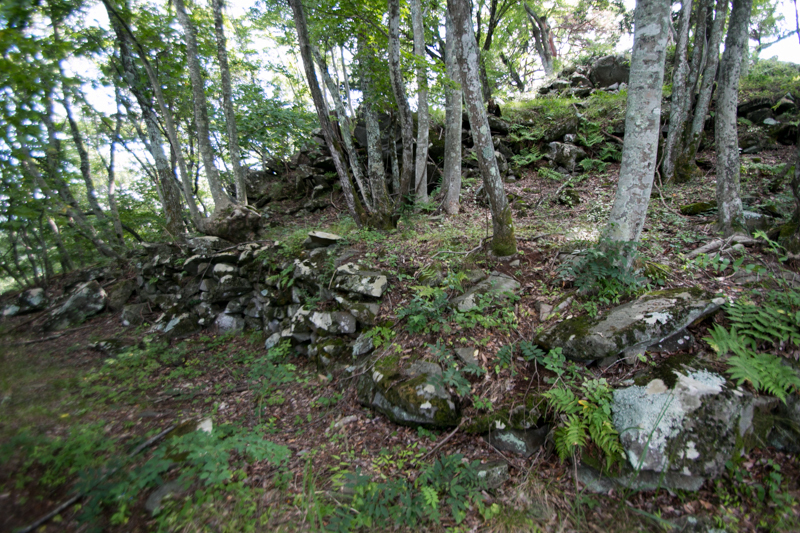 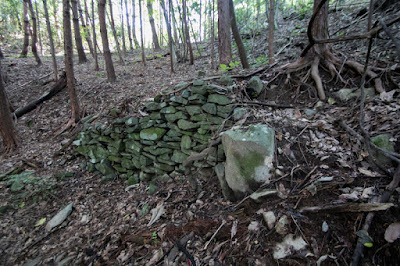 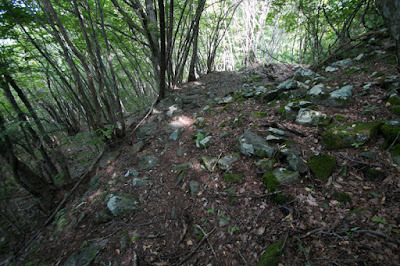 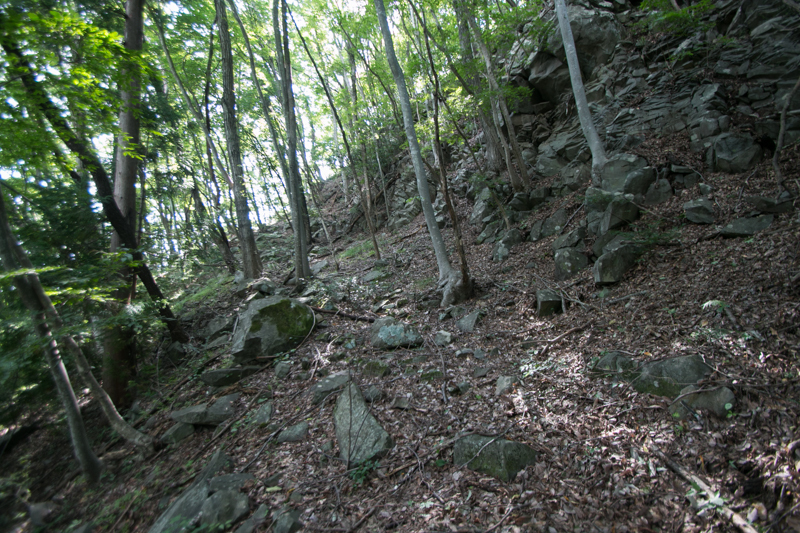 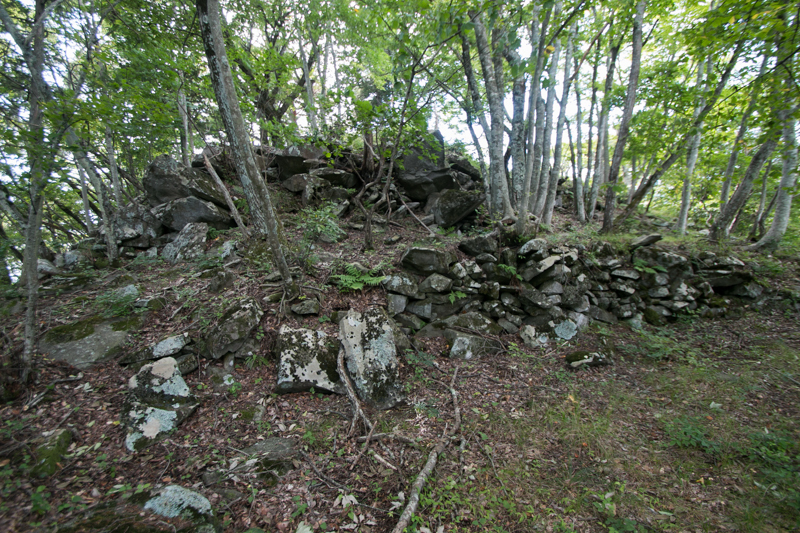 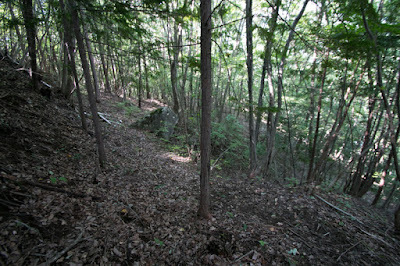 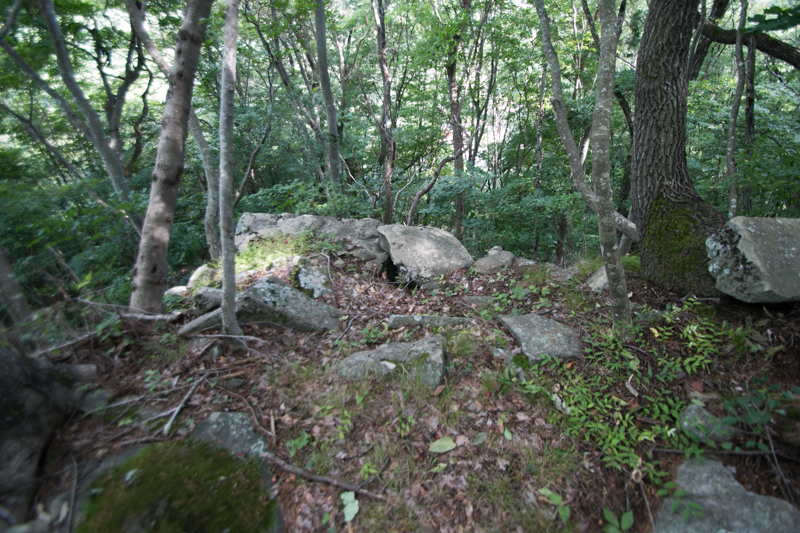 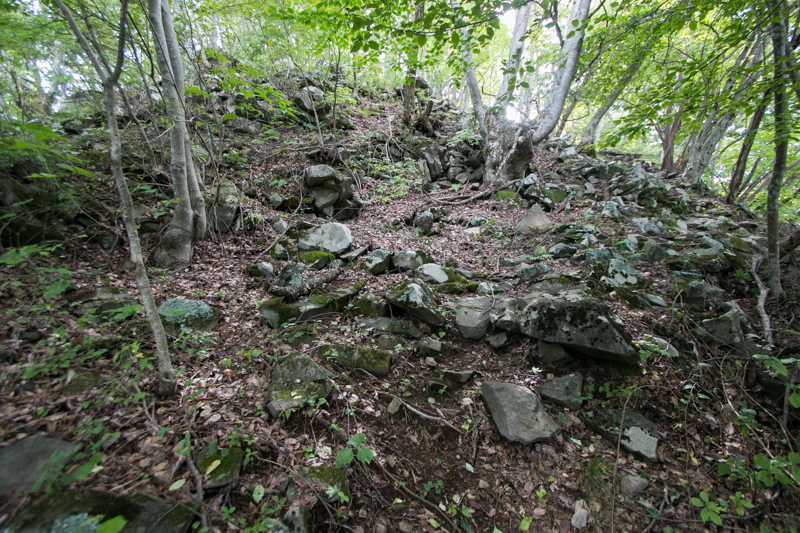 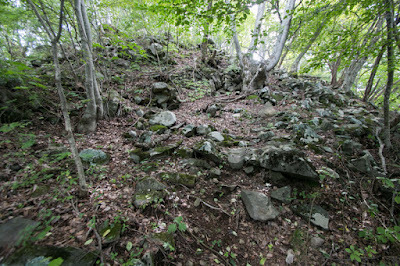 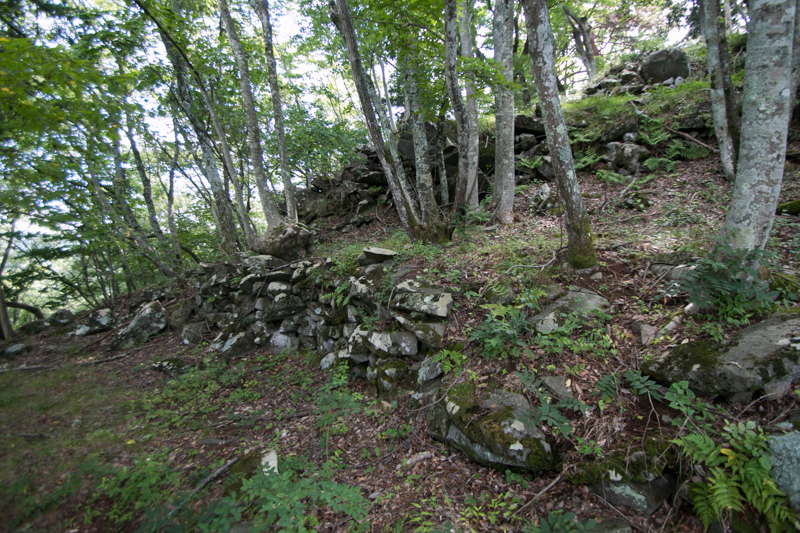 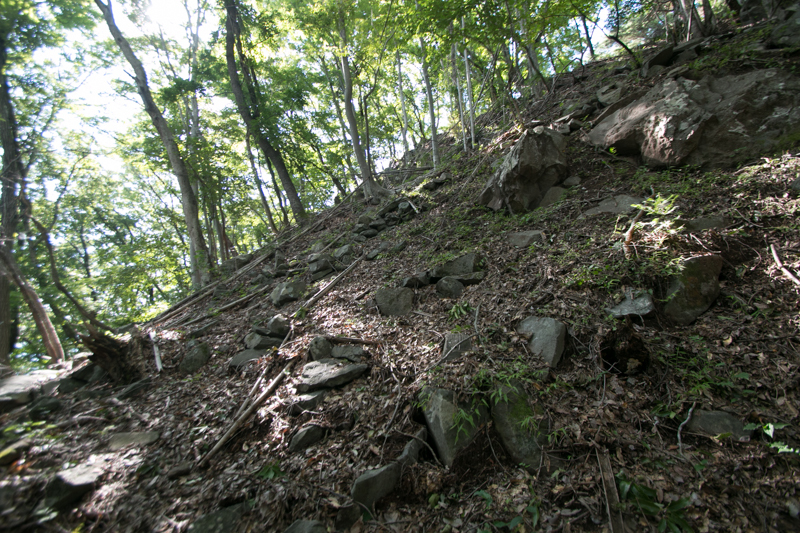 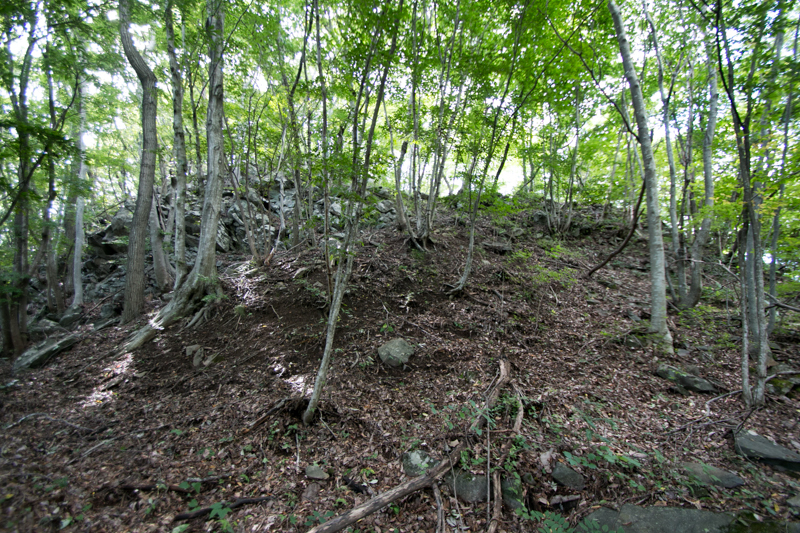 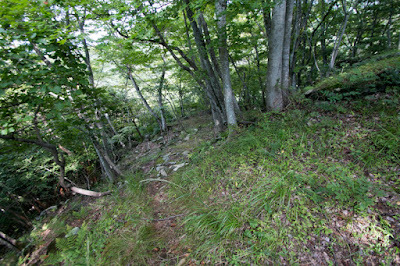 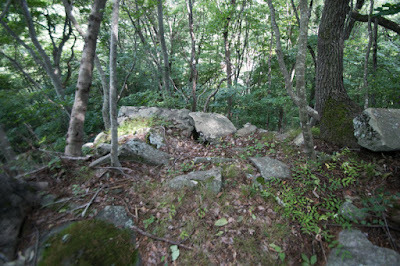 As Shiroyama mountain is covered by numerous rocks, front side of upper areas are covered by stone walls. 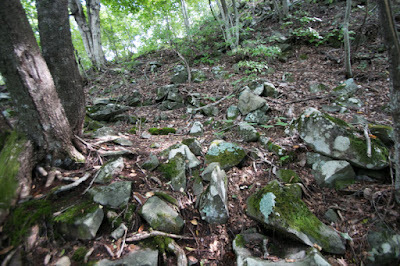 But these stone walla are premature one and just putting up stones broken into flat shape. 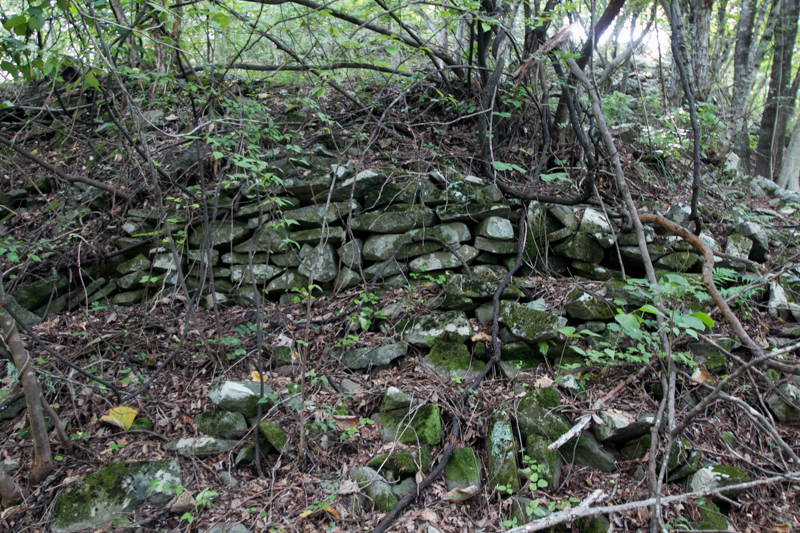 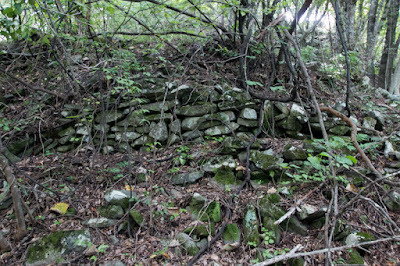 This style of stone walls resembles to the castles built by or under influence of Tokugawa clan such as Ogyu castle (Aichi prefecture) or Haibara castle (Nagano prefecture). But interestingly, the stone wall of the first level is built up as a chest wall, to shut intruding enemy by matchlock gun from inside. 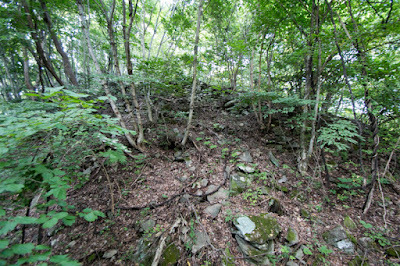 Below of this area a virtical wall was built to obstruct horizontal movement of enemy, and each gate was folded to stop direct entrance of enemy. 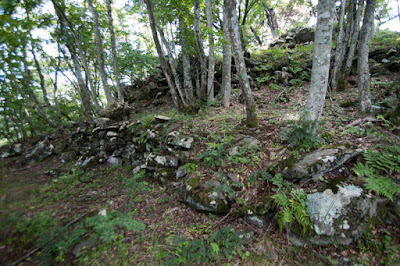 Probably after the occupation of Tokugawa clan at the battle against Hojyo clan, they effectively strengthened this castle with technology and material at hand. Under Shingen Takeda clan became a strong warlord held Kai province (Yamanashi prefecture), Shinano province, Kozuke province (Gunma prefecture), Suruga province (eastern half of Shizuoka prefecture) and Totomi province (western half of Shizuoka prefecture). 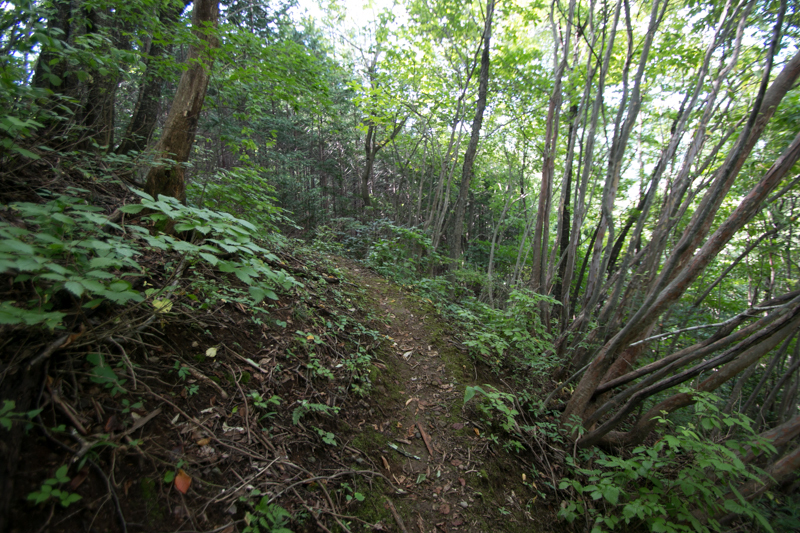 But in 1573 Shingen died in ill on the way of expedition to Kyoto city, and his Katsuyori Takeda (1546-1582) succeeded leader position. Katsuyori was a brave leader equivalent to Shingen and keep fight with central ruler Nobunaga Oda (1534-1582) and his ally Ieyasu Tokugawa (1543-1616). 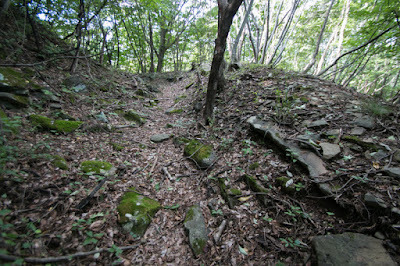 But in 1575, Katsuyori suffered severe defeat before matchlock gunners of Nobunaga at the battle of Nagshino, and Takeda clan began to decline. 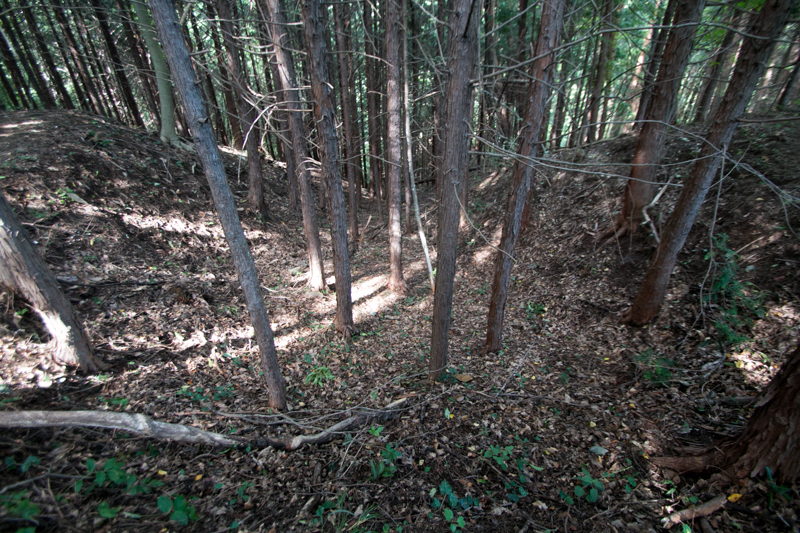 Katsuyori struggled to restore the clan but finally in 1582, Takeda clan collapsed by invasion of Oda and Tokugawa army then Katsuyori killed himself. 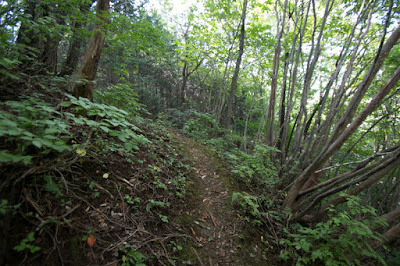 Takeda clan had the history from Yoshimitsu Minamoto (1045-1127) ended its over 500 years history. 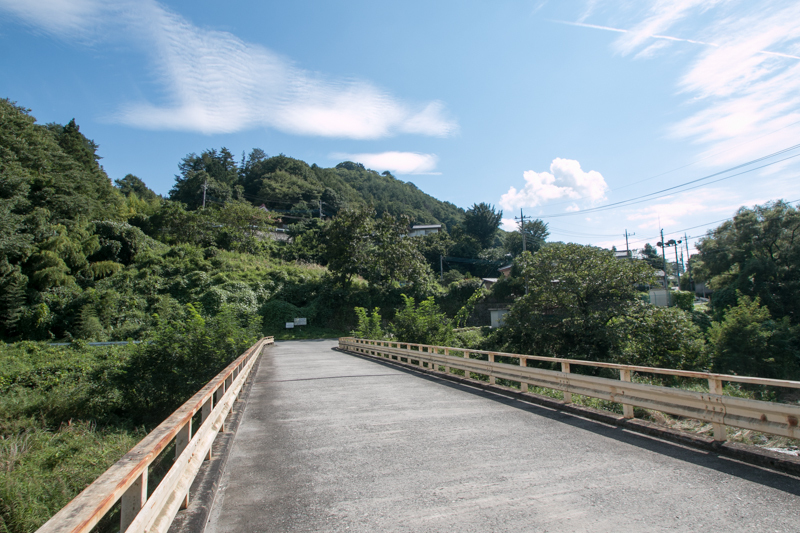 After the fall of Takeda clan, Nobunaga placed his veteran general Nobutaka Kawajiri (1527-1582) as the lord of Kai province, Nagayoshi Mori (1558-1584) as the one of Shinano province, and nominated Kazumasu Takigawa (1525-1586) as general commander of Kanto region and lord of Kozuke province. 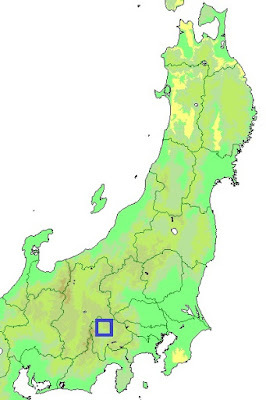 Suruga province was given to Ieyasu Tokugawa. 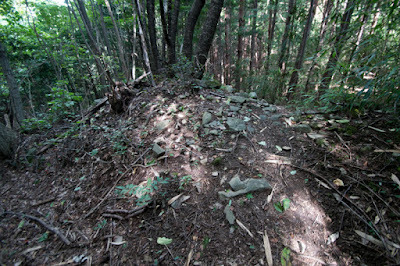 But just 3 month after the fall of Takeda clan, Nobunaga and his successor Nobutada Oda (1557-1582) died in the incident of Honnoji, a coup d'etat by his general Mitsuhide Akechi (1521-1582). As new lords had not yet established their governance, hearing the news of the death of Nobunaga, rebellion of former Takeda retainers occurred at Kai province and Shinano province. 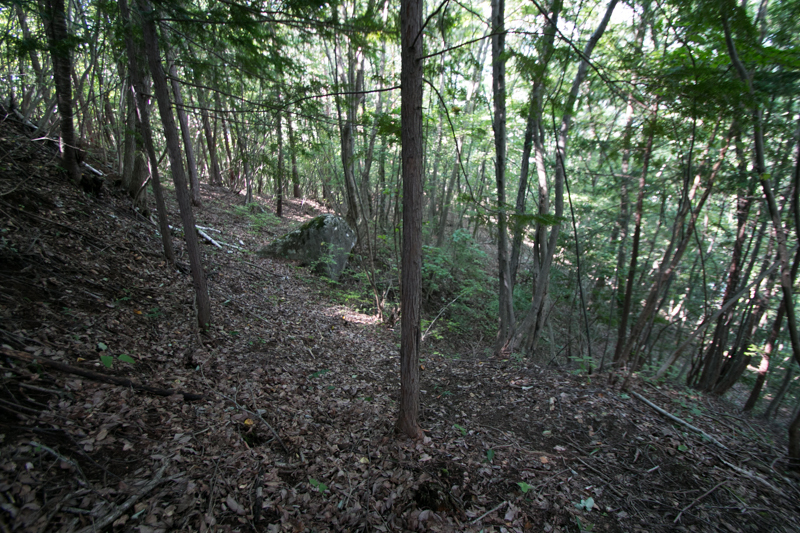 Hidetaka Kawajiri was killed by rebels, and Nagayoshi Mori barely escaped from Shinano region. 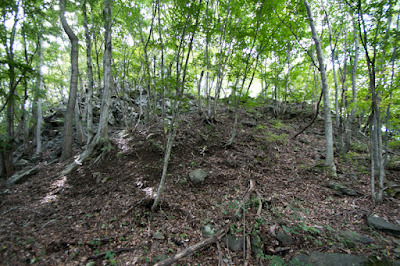 Kazumasu Takigawa fought with Hojyo clan which was the strong warlord of Sagami province (Kanagawa prefecture) once followed to Nobunaga at the battle of Kannagawa but suffered defeat, then also escaped to his original territory. In this way, former heritage of Takeda clan except for Suruga province became vacant area and inheritance struggle had begun. 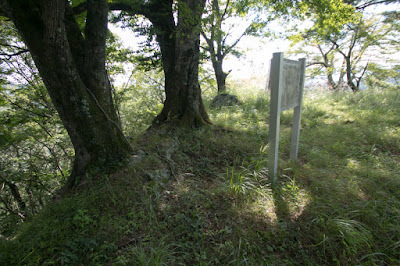 The major parties of this inheritance struggle were Ieyasu Tokugawa and Hojyo clan. Ieyasu Tokugawa barely survived crisis after the death of Nobunaga returned to his nation and promptly expanded into Kai province and Shinano province. Ieyasu formerly fought with Shingen but was totally defeated at the battle of Mikatagahara in 1573, and since then Ieyasu respected the way of Shingen and secretly kept former retainer of Takeda clan against the will of Nobunaga. 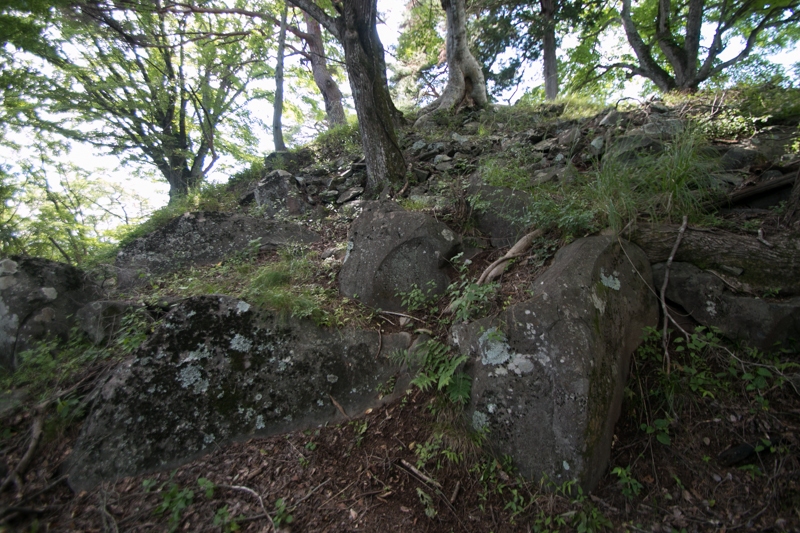 Ieyasu sent these former retainers of Takeda clan, and seized Kai province and south part of Shinano province. 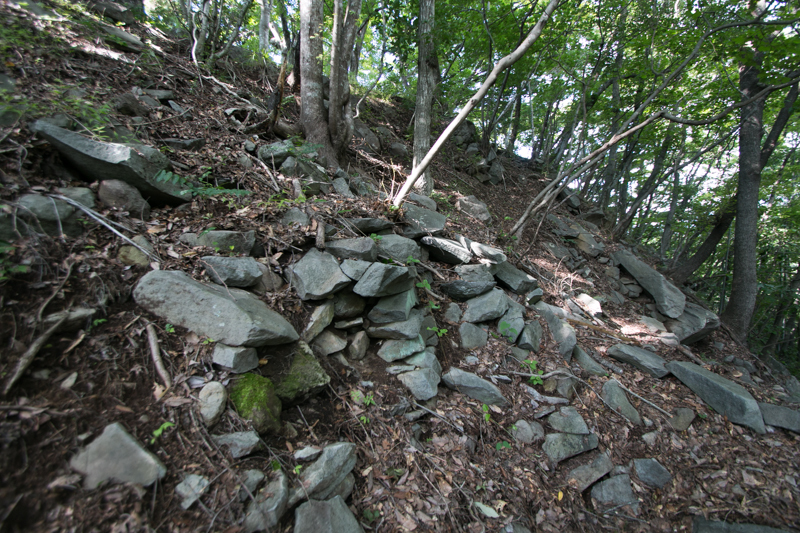 On the other hand, Hojyo clan which seized Kozuke province also hoped remaining former territory of Takeda clan and sent large army to Shinano province from Usuitoge path. 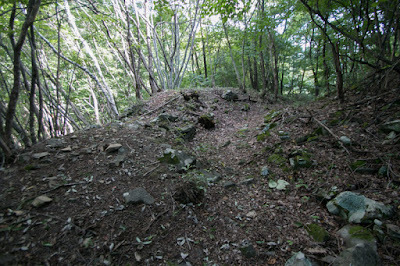 Facing dominant army of Hojyo clan, local lords of Shinano province such as Masayuki Sanada (1547-1611), Kiso clan or Ogasawara clan followed to Hojyo clan, then Hojyo clan seized most part of Shinano province then turned to Kai province. 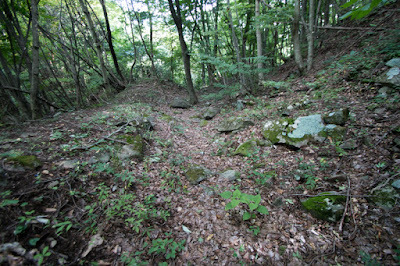 As such, battle of Hojyo clan and Ieyasu Tokugawa called as Tensho Jingo no Ran started. 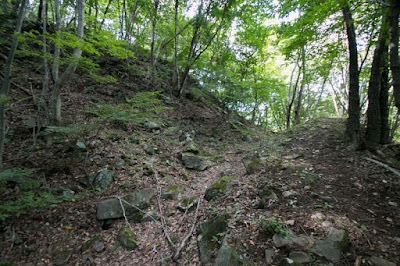 As Ieyasu had smaller army than Hojyo clan, Ieyasu besieged at Shinpu castle, the former residence of Katsuyori Takeda, to stop the intrusion of Hojyo army into Kofu basin. In response to this, Hojyo army stayed Wakamiko castle and Shishiku castle then both party confronted at north edge of Kofu basin in August 1582. 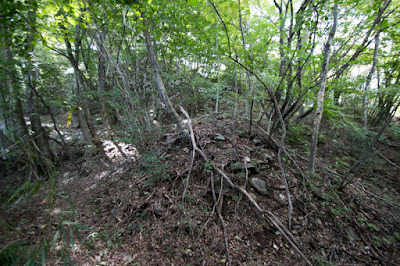 Hojyo army was dominant at this place and Ieyasu could not move from Shinpu castle. 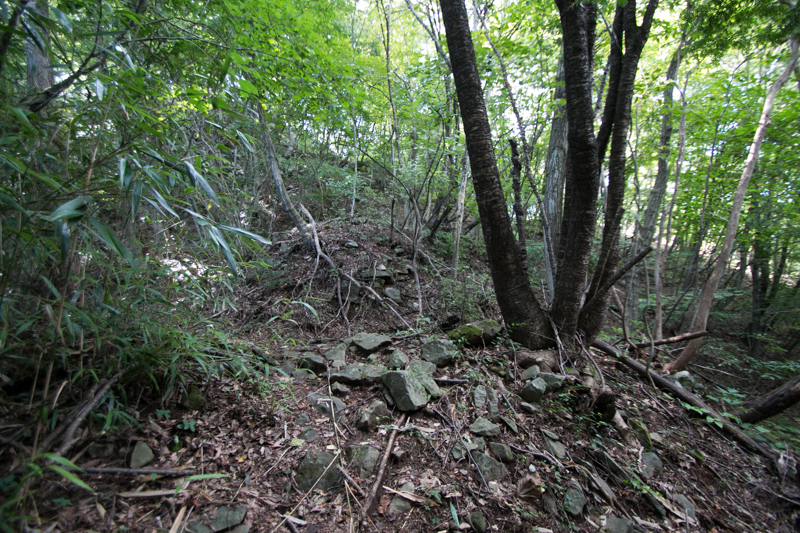 Looking at this situation, Hojyo clan sent a detached force from their territory Sagami province toward Kofu basin, from backside of Tokugawa army. But Mototada Torii (1539-1600), a brave general of Ieyasu known for later hard fighting and death at Fushimi castle before the battle of Sekigahara in 1600, rejected attack of Hojyo army having 10 time soldiers. 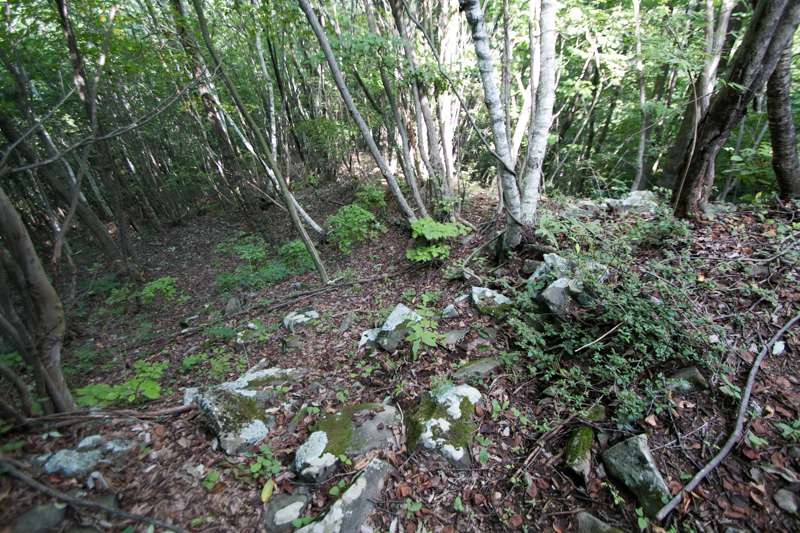 Ieyasu escaped this crisis strengthened diplomatic negotiations to local lords of Shinano province. 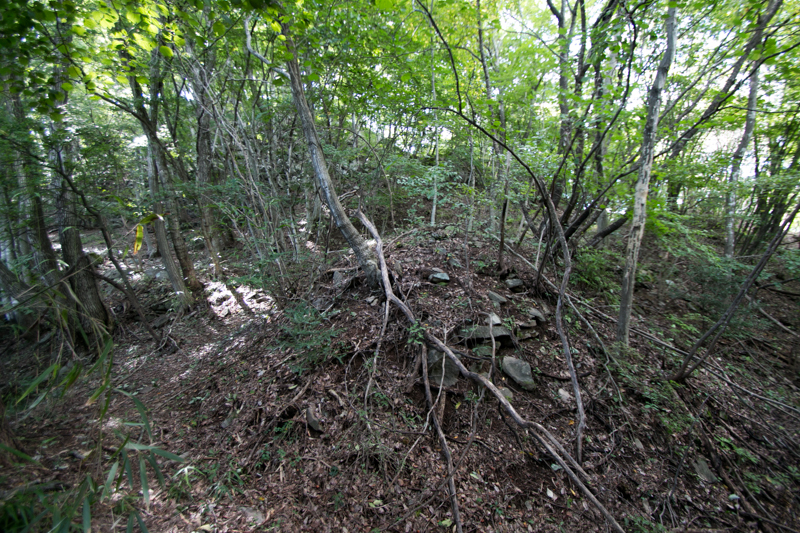 Originally Masayuki Sanada deprived Numata castle (Gunma prefecture) from Hojyo clan, and even though followed to Hojyo clan, there was a fear to lose Numata castle and substantive conflict of interest. 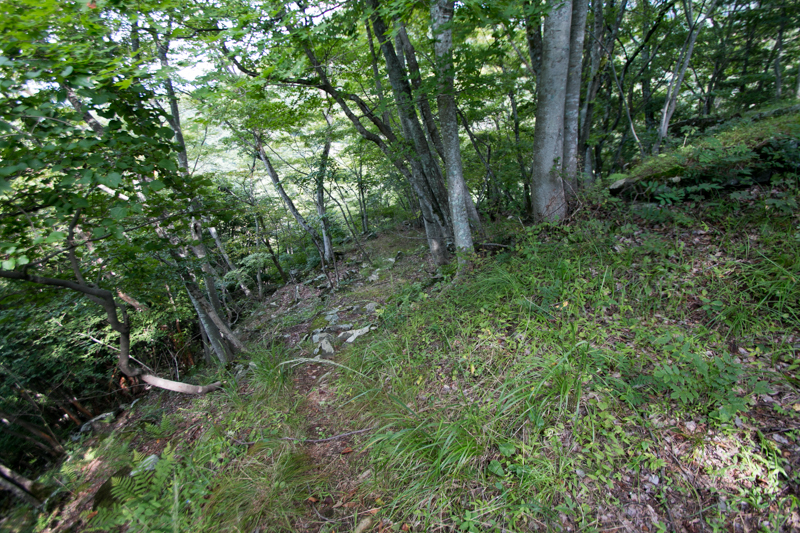 Looking at this Ieyasu invited Masayuki to change to his side, and Masayuki turned to Ieyasu and shut the supply line of Hojyo army passing Usuitoge path along with Nobushige Yoda (1548-1583) . 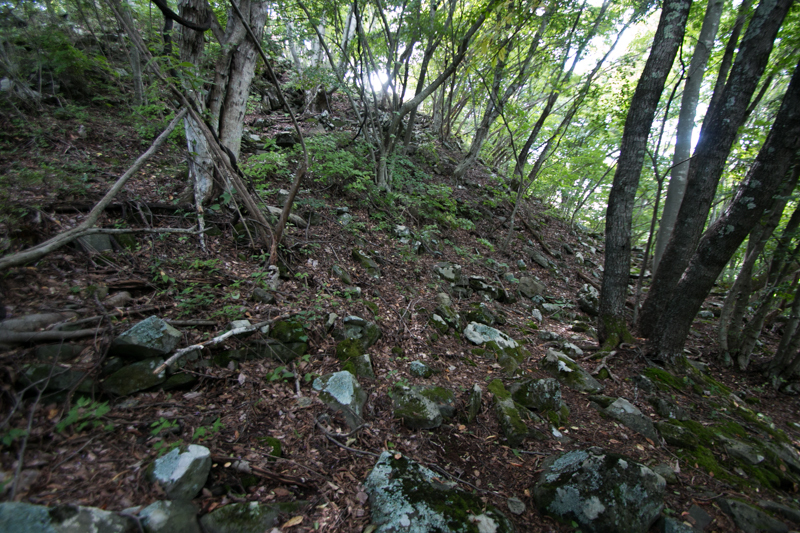 In September, Tokugawa army lead by Masashige Hattori (1542-1596) kwown as the leader of Iga Ninja force under Ieyasu, made night attack to Shishiku castle and captured it. This attack might be performed to give a pressure to Hojyo army and make supply line to Masayuki Sanada and Nobushige Yoda struggled to shut down the supply line of Hojyo army at eastern part of Shinano province. 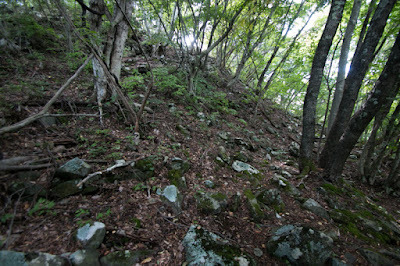 Hojyo army stayed at Kai province still had dominant army but there might be a possibility to starve out. 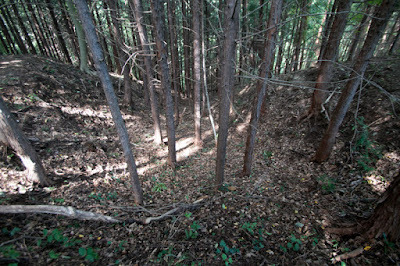 Furthermore, anti Hojyo power such as Satake clan strengthened attack to Hojyo territory looking at absence of main force, then Hojyo clan could not continue confrontation to Tokugawa army. Originally Hojyo clan aimed unification of Kanto region and did not feel important for other territories, thus finally in October, both party made peace then Kai province and Shinano province were finally held by Ieyasu. 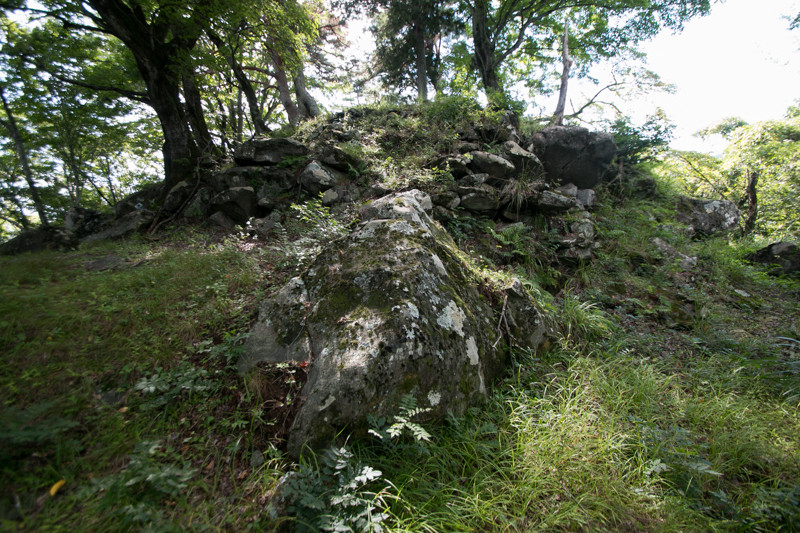 Through this hard fight, Ieyasu grew from inferior ally of Nobunaga to independent strong warlord both in name and reality. Along with the tactical victory against Hideyoshi Toyotomi (1537-1598) at the battle of Komaki Nagakute, it became the basis of final unification of Japan by Ieyasu. 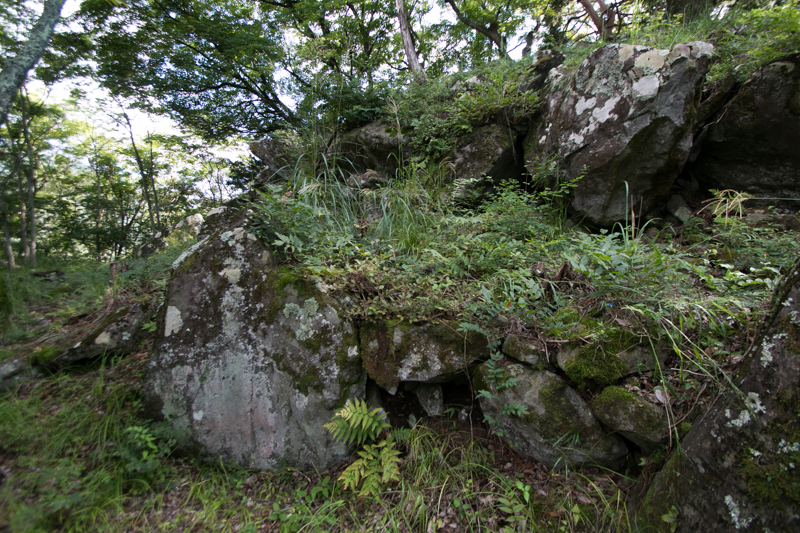 On the other hand, by this defeat Hojyo clan was fixed as a regional ruler of Kanto region, and was finally subjugated by Hideoshi with central authority in 1590. 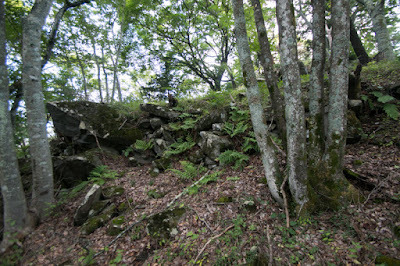 If Hojyo clan achieved this confrontation against Ieyasu, Hojyo clam might be able to intervene the conflict between successors of Nobunaga and achieve authority then there could be other result for the clan.